This is a simple craft to do as part of a Mexican (Aztec) history lesson. Younger children will paint simpler images and older children or art students can make them more complex. Paint (we used brown and yellow) -- shades of black, white, brown, orange, yellow and red are all appropriate choices. Draw a rough design on a scrap piece of paper. You can use anything as your inspiration. The sun is a very popular image in Aztec art. Images from the Aztec calendar are also popular subjects -- each day of the month has its own symbol. Here are just a few that we liked. Aztec goddess (rabbit) Tochtli -- A day of self sacrifice and service to something greater than oneself. 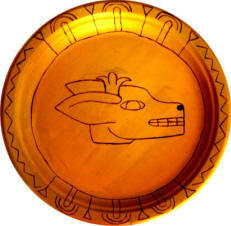 Aztec god (deer) Mazatl -- A day for breaking old routines. Aztec god (lizard) Cuetzpalin -- A good day to work on your reputation through actions not words. Remember you need to keep the image simple enough to paint it. Paint your paper plate a base color (we used yellow paint for this). Note: acrylic paint dries very fast. If your children are old enough to keep it off their clothes, it's a great option. If it does get onto something, wash it out immediately... Once it dries, it is not washable. Use paint colours like brown or black to paint the design on your plate. Add a little bit of geometric design around the edge of the plate.